These mouth-watering skewers make a great summer entrée or canape. Put flour onto a plate. Beat egg in a shallow bowl. Pour sesame seeds onto a second plate. Coat halloumi cubes in flour, shaking off excess. Dip in egg, then roll in sesame seeds to coat. Line a baking tray with paper towels. Pour oil into a large pot until it reaches about 1.5cm up the sides. Heat over medium. Add a third of cubes to hot oil. Do not crowd pot. Cook, turning cubes often, until sesame seeds turn golden brown, 30 sec to 1 min. Remove and place on lined baking tray. Repeat with remaining cubes. 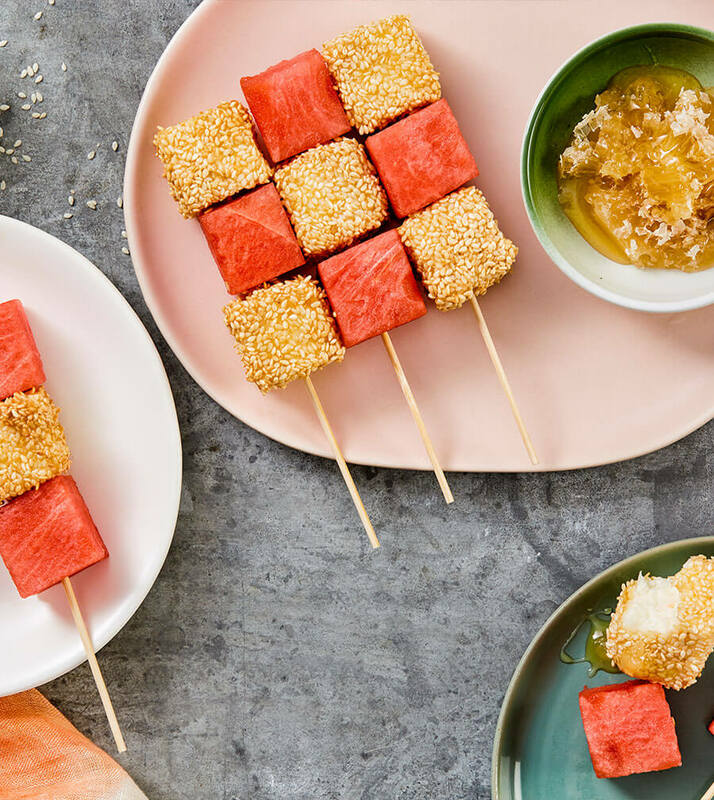 Alternately thread halloumi and watermelon cubes onto skewers. Warm honey in microwave, about 30 sec. Drizzle skewers with warm honey just before serving.